Note 6/30/2012: Here is a list of most of the breadth indicators that I track and log on a daily basis. Most of the charts are self explanatory. Just look at the HL lines. Others will need explanation, which I will be adding as time goes on. 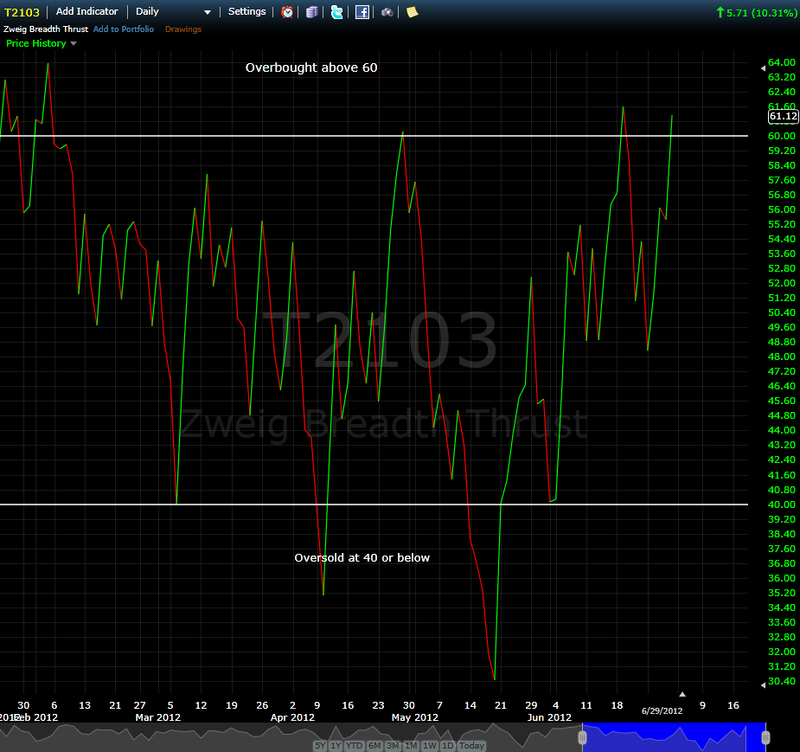 I will also be working on adding a useful link to the charts from FreeStockCharts.com. In the past, those links have only worked for a short while, probably due to my error. There are also a couple of links at the bottom of the page for the end of day P/C Ratio and $TRIN, $TICK & Advancing Volume with Declining Volume, which is how I calculate 90% days. 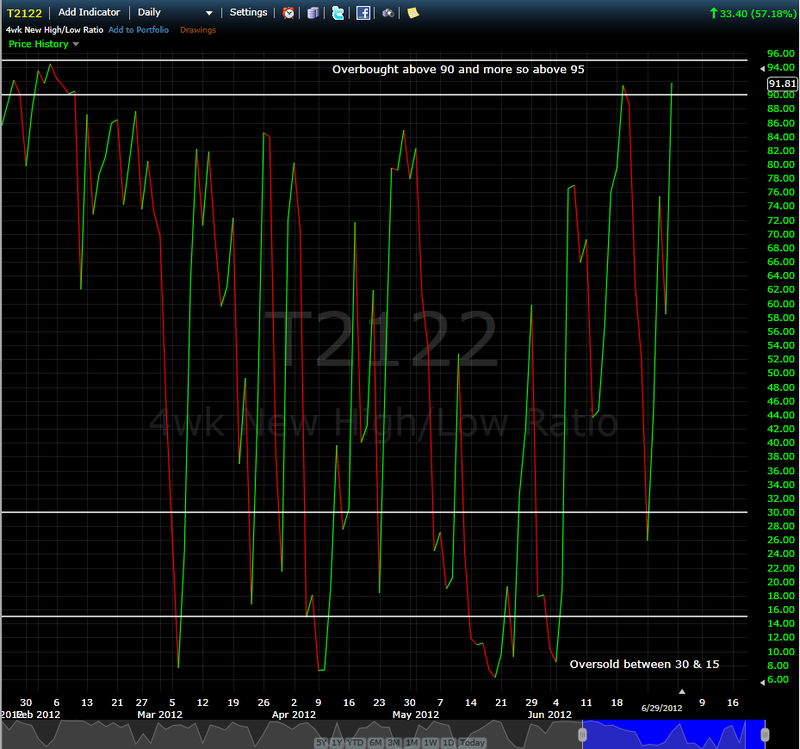 One thing you will notice specific to Friday, June 29th is that the markets pushed deep into overbought territory. Because of the upcoming holiday, it’s difficult to say how this situation will resolve but if there is any more upside left in the markets next Monday and Tuesday it is likely to be limited. This comment will be removed in a few days. When you start thinking that maybe the bullishness is getting ahead of itself, then checking a chart like the one below will help you confirm your concerns. The original idea for this chart was that when the the $VIX 5EMA drops below 15.5 then you would want to start looking for the exits. 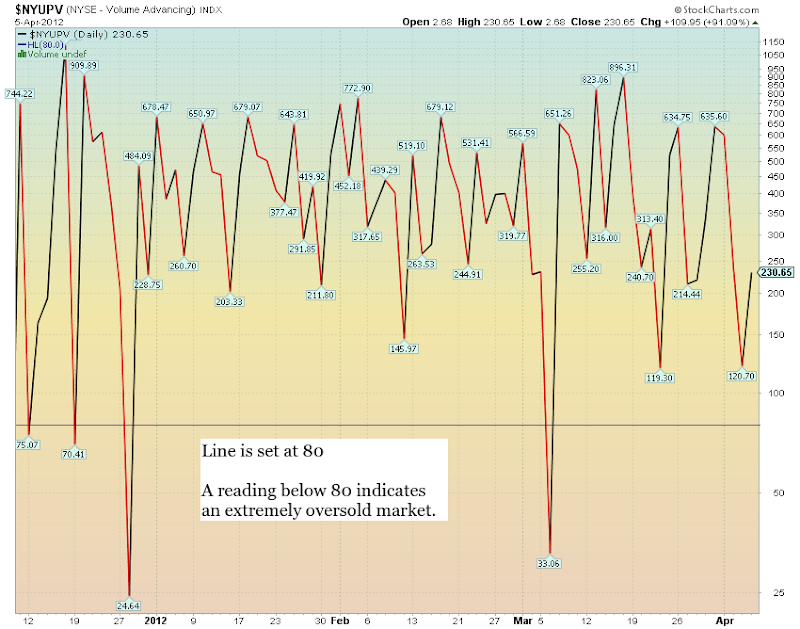 This needs to be updated because a more accurate reading is close to or below 12.5 for the 5EMA. As of the close of trading on 9/19/2013, the reading on the 5EMA is about 13.8 so this has several more days to go before it’s time to wave the red flag. Of course past performance need not always match up with future performance so the proof will be in the pudding. 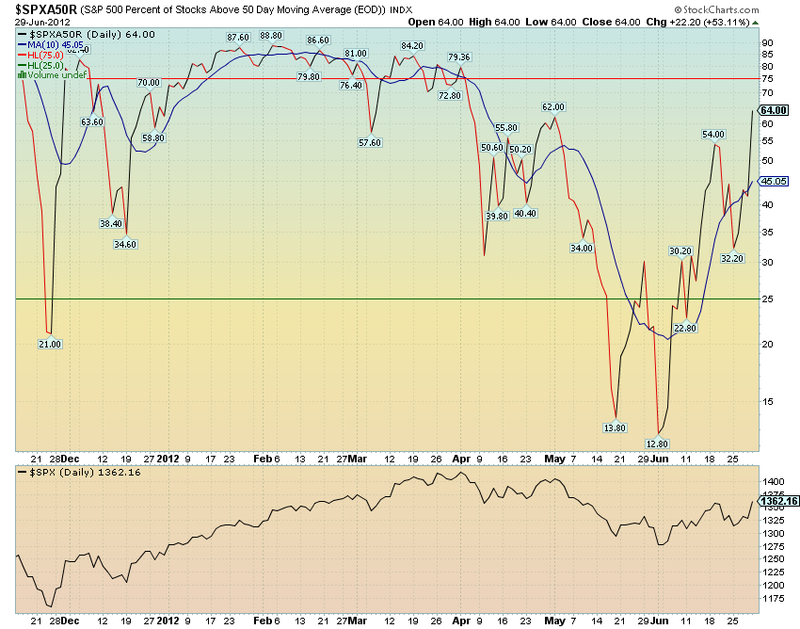 It’s also important to note that lately market declines have ended when the 5EMA reaches the 19-20 area. The 5EMA almost hit 19 on Tuesday, October 8th, and, as of Friday, October 11th, the market appears to have reversed course. I don’t look at the chart below on a regular basis but I do check it when the bullish froth starts getting a little too thick. The following is a list along with bookmarkable links to the breadth indicators that I follow and log on a daily basis. For this information to be useful to you, you too should log the daily numbers that these indicators produce. By doing so daily, you will not be caught off guard by the market. For example, the first chart I’ve put up is of $NYUPV. $NYUPV tracks the daily up volume and when it drops below 80 it indicates that the market has gone into extreme oversold mode and that market participants should expect a bounce of one kind or another in the following session. If, on March 6th, you happened to be short the market but you also checked $NYUPV at the market close, you would have had good reason to cover your short position. 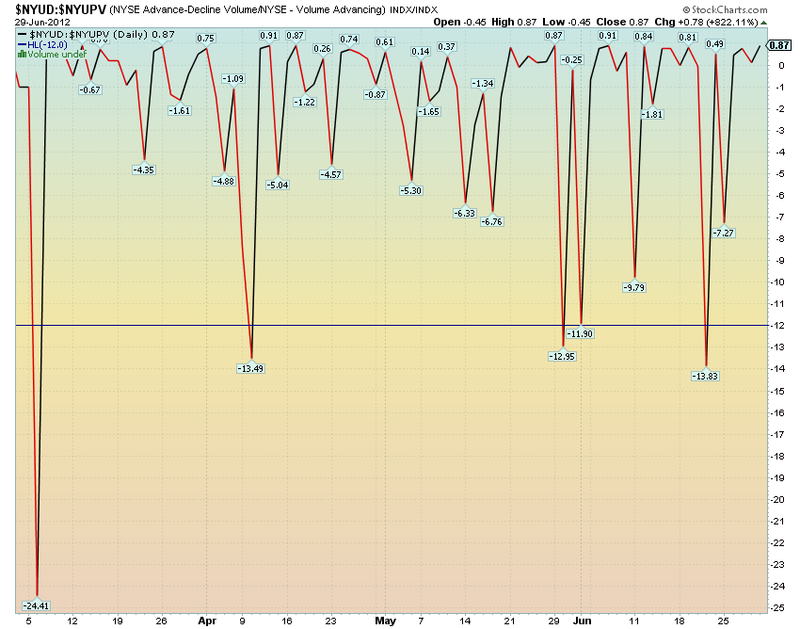 You can check $NYUPV throughout the day, but the readings don’t mean much until a few minutes before the close. Still, if the market is dropping like a rock and there is panic in the air, $NYUPV will let you know if there is enough panic. What you can’t see on the chart is the fact that on Wednesday, April 4th, $NYUPV spent much of the day below the 80 level and only near the end of the day, when the big computers kicked in with their ‘buy’ programs, did $NYUPV rise above the important 80 level and then closed at 120.70. I use $NYDNV to let me know when there’s just been too much buying and there just isn’t any down volume. On June 29th, with a reading of 119, $NYDNV is giving just such a signal and is warning that on the 29th there was just too much bullishness in the markets. At minimum, $NYDNV is warning of a pause day in the next session and at maximum it is warning of a short term market top of one degree or another. $NYADV is the flip side of $NYDNV. With readings above 2500 it warns of an overbought market and warns of a pause day in the next session or a short term top of one degree or another. 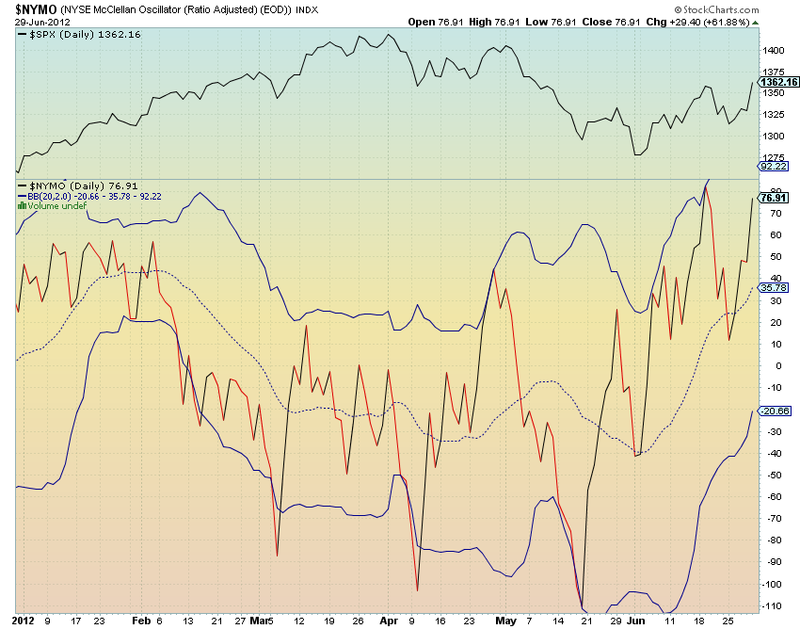 While it may seem that using $NYDNV and $NYADV is redundant, there are times when these two do not give sympathetic readings and it is the sympathetic readings that are most important and should put a trader on high alert, as is the case on June 29th, 2012. 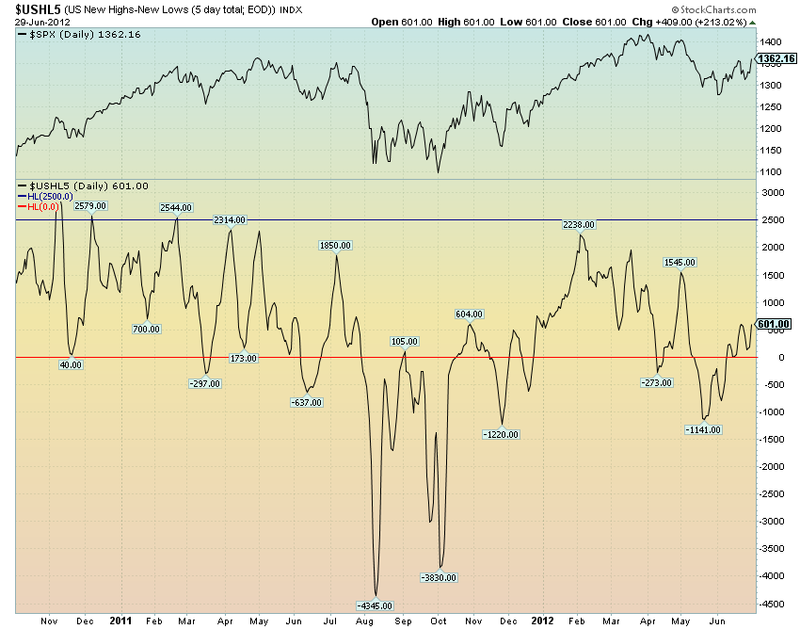 $NYUD:$NYUPV is one of the most reliable indicators that I have found. 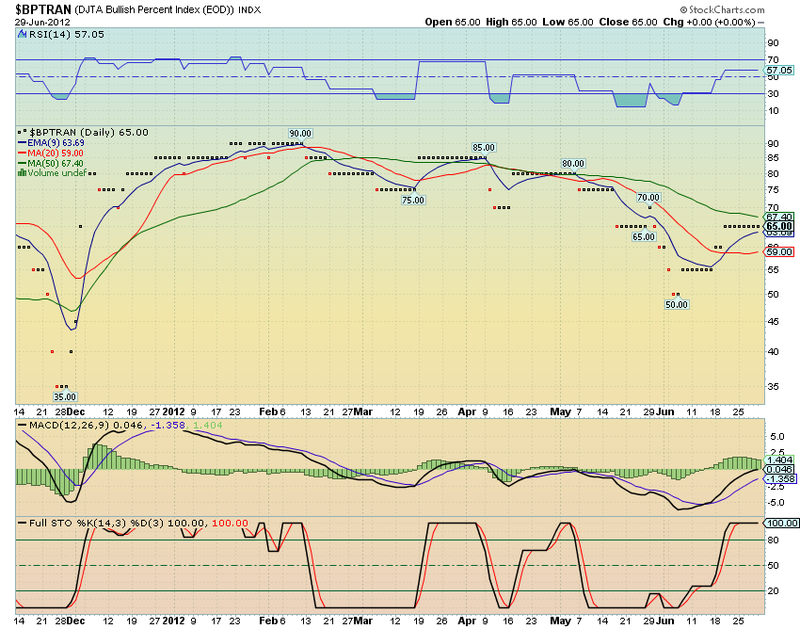 It is useless when the market is rising but when the market begins to fall, $NYUD:$NYUPV will give great bottom signals. It works in sympathy with $NYUPV. 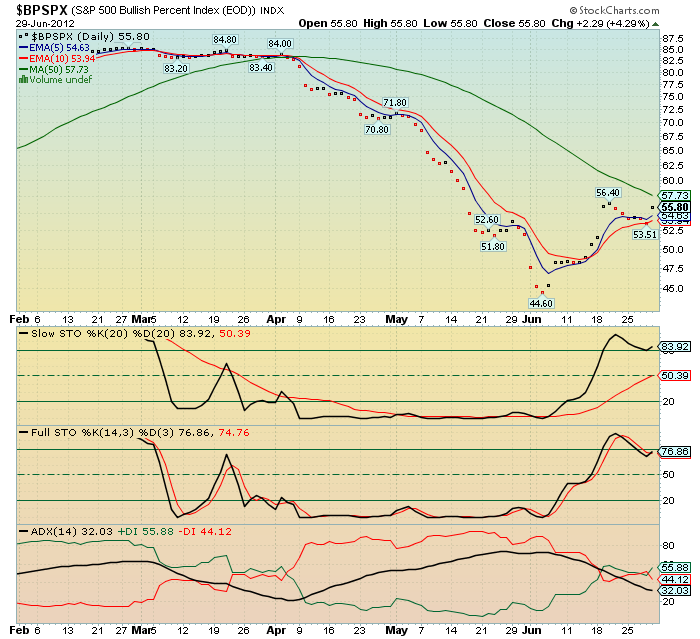 The bottom signals come when $NYUD:$NYUPV drops to or below -12. 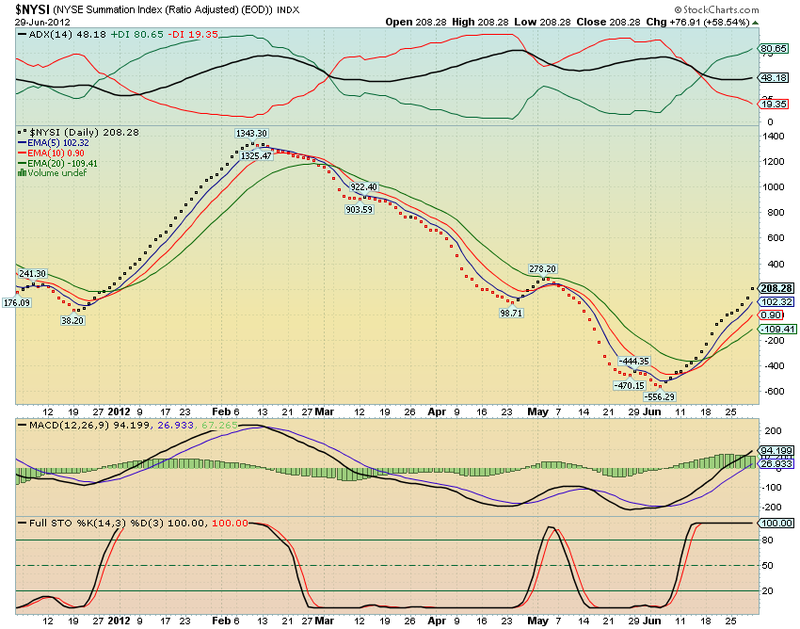 On Thursday, June 21st, $NYUD:$NYUPV dropped to -13 and $SPX lost 30pts to close at 1325.51. While this was not the closing low of this particular down leg, it was within 12pts of that closing low which came on June 25th with $SPX closing at 1313.72. While it’s great to get the bottom, coming within 12pts of the bottom ain’t too shabby. I use $NYHGH as a way to make sure that new highs are moving in sync with the markets. I watch for times when $NYHGH either goes into positive or negative divergence. For instance, if the market drops one day and $NYHGH ticks up, then this indicates that there is underlying strength in the market and that the drop in the market shouldn’t be taken too seriously. 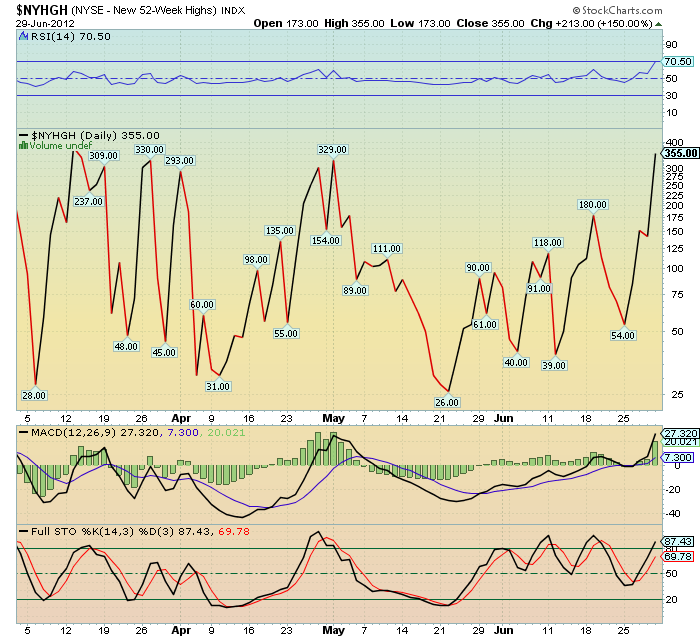 The daily $NYAD is of great use in spotting a market that has become overbought or oversold. I use it in conjunction with the other indicators because I feel it’s important to have confirmation on as many fronts as possible. 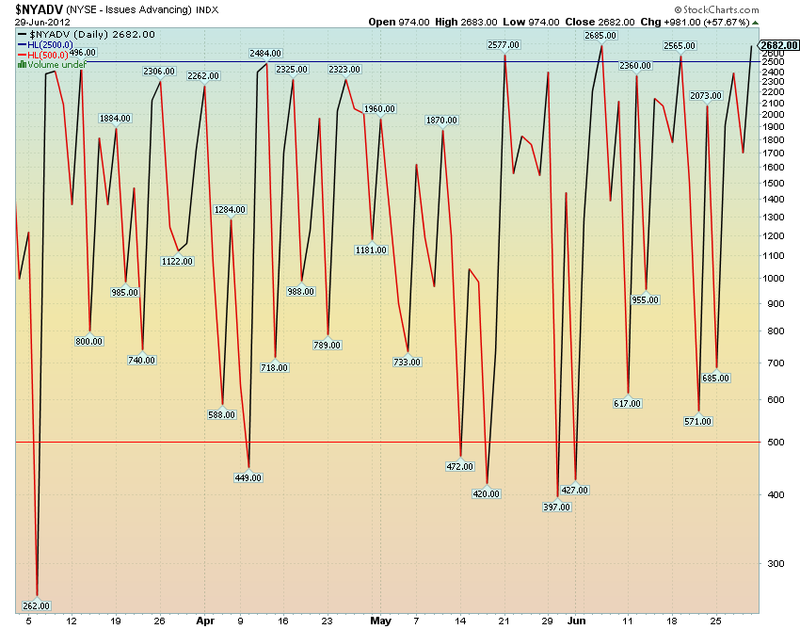 On June 29th, with a reading of 2289, the daily $NYAD is confirming many of the other indicators on this page. 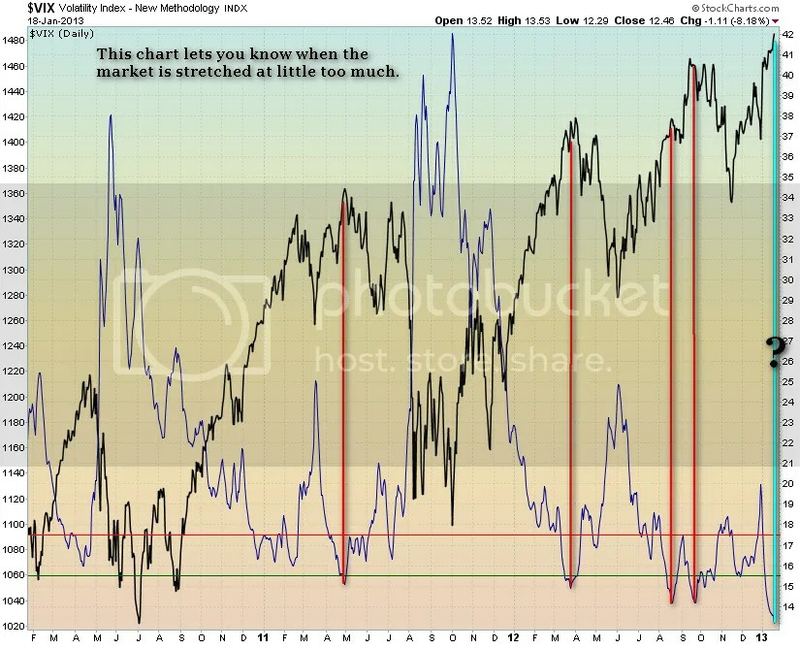 This is one of the most watched indicators out there. 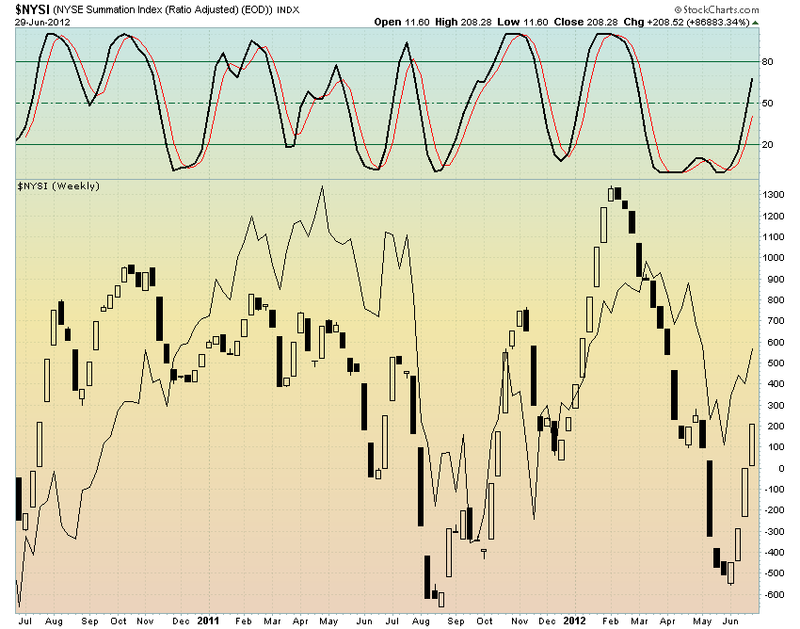 I use it to spot times of positive or negative divergence. Such instances are rare but important when they occur. 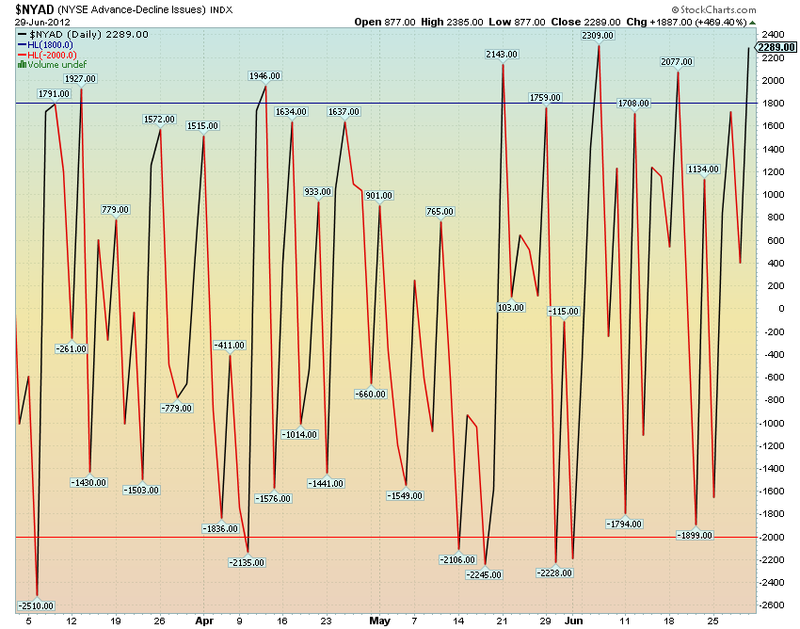 For instance, on Thursday, June 28th, the cumulative $NYAD ticked up even as the market dropped. It’s been a long time since the last time $NYAD was not in sync with the market and I felt at minimum that it was signalling a positive day for Friday, the 29th and I was curious to see what would happen on the 29th. Of course news out of Europe trumped everything. I use $USHL in the same way that I use $NYHGH. I look for positive or negative divergence with the market as either red flags or green flags. This is a tough one and I think it’s due to all the volatility in the markets of late. The idea here is that $USHL5 should give indication of an overbought market with readings at or above 2500 and you can see on the chart that it has worked fairly well with readings at those levels. On the downside, readings below the zero line should indicate an extremely oversold market but you can see on the chart that $USHL5 has dropped below zero and then just kept on going. This has forced me to adjust my use of this indicator. Now I am watching as $USHL5 is putting in higher lows as a sign of positive divergence even as the market dropped and put in new lows. On Friday, June 29th, $USHL5 managed to put in a slightly higher high, very slight, and could be signalling hidden weakness in the markets. We’ll just have to wait and see on this one. I don’t know of anyone else who uses $NYMO like this, but I have found it to be an incredible indicator with Bollinger Bands. 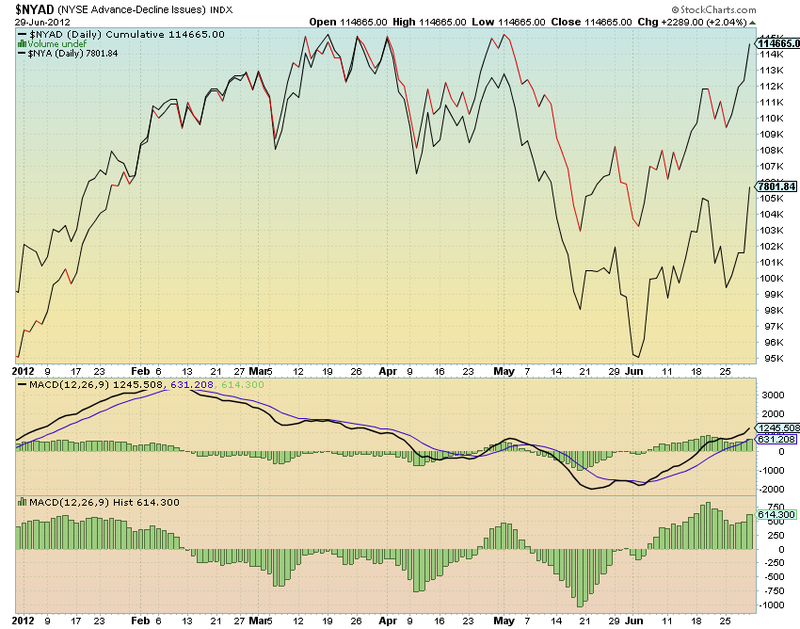 The last good signal $NYMO gave was on June 19th with $SPX closing at 1357.20. $NYMO pushed up above its upper BB by one point and warned that the market had gotten ahead of itself, along with several other indicators. I use everything on this chart visually when tracking $NYSI and log the daily movement of the $NYSI and it’s closing value. I have found that when $NYSI gives a reading of between 70-80 pts, in either direction, it signals that either the buying or the selling is overdone. Higher readings are even more conclusive. 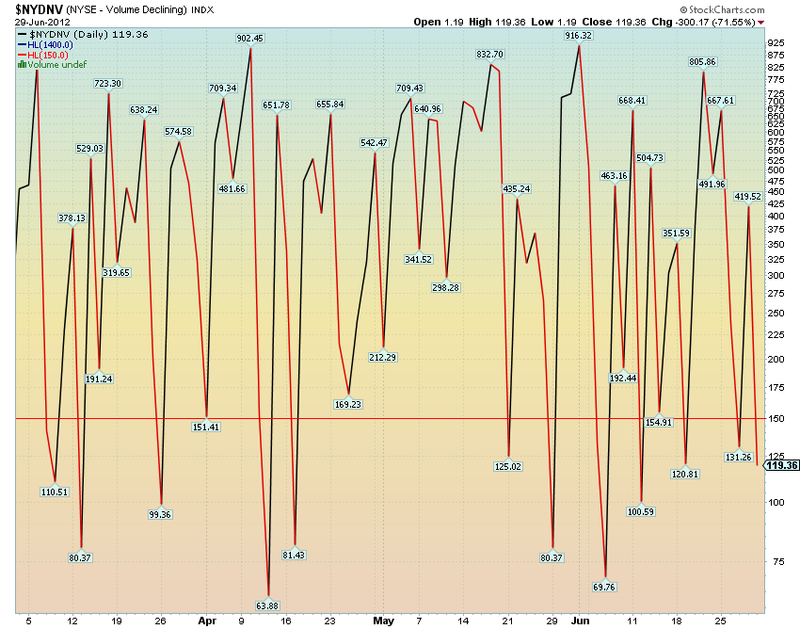 For instance, $NYSI rose by 83pts on Tuesday, June 19th. This indicated an overbought market, along with several other indicators that I use, and the market rolled over shortly there after. On Friday, June 29th, $NYSI rose by 77pts and so is signalling an overbought market that is in need of a cooling off period of one degree or another. I mainly use the stochastic on the this chart and you can see that after putting in a nice W bottom the stochastic has since had a bullish cross and has been moving up nicely since. This particular weekly set up was passed along to me from an old trading buddy from Finland. Thanks, Christian. P/C Ratio, end of day updated around 6:00 P.M. ET.